I'm beginning to think that dangerous driving is silently encouraged to provide local services/businesses such as hospitals, recovery, insurance and garages more income. Dozed off as compared to fell asleep a few days ago killing the hostess. I’ll take it! Looks like another one of those banned buses, my dear Watson. this is sadly becoming a daily occurrence, I'm beginning to become immune to these reports now. is there any chance a government will act to increase road safety in this country? .....is there any chance a government will act to increase road safety in this country? Add that to the one who lost his head. All at about 2.30am near Korat. I am beginning to see a pattern here. 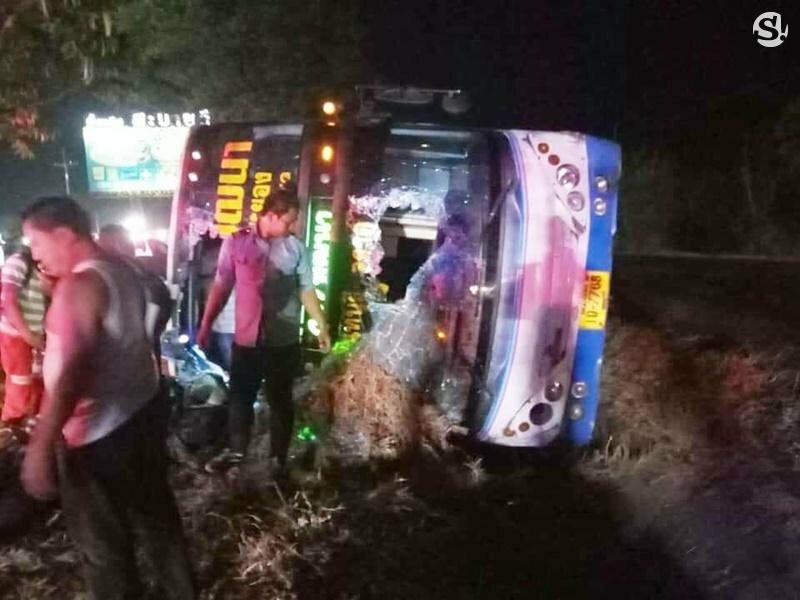 Where are the Thai ghost experts telling us the highway is haunted by the ghosts of previous bus accidents? does not nod off, one thing for sure i would not fall asleep. You are aware who at the helm is in charge for road safety, are you? I am more afraid riding one of these buses than flying. This is a daily occurrence. will wait for tomorrows news of another coach driver falling asleep ! !